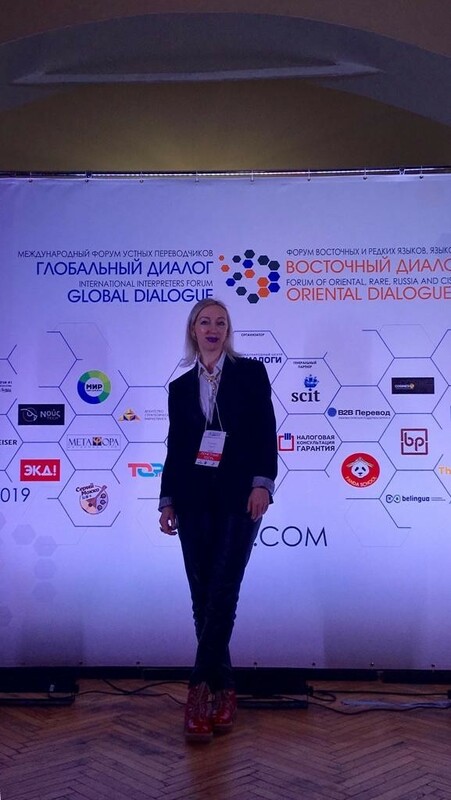 On January 21-26, 2019 Moscow hosted the Second International Forum of Conference Interpreters “Global Dialogue”, organized by ANO “DIALOGUES International center” together with the Moscow State Linguistic University, the leading linguistic educational institution in Russia. The forum saw presentations and lively discussions among professionals on such issues as future interpreter’s competences in a rapidly changing world and interpreter’s role in global events. The event brought together Russia’s most prominent interpreters, foreign experts, representatives of corresponding ministries, agencies and government bodies including the Russian Foreign Ministry and the Federation Council, as well as ambassadors and diplomats from partner countries, heads of linguistic departments of large corporations, professional associations, faculty members from major Russian and international linguistic universities, language service providers and event-organizers. Participating in the forum events, Olga Egorova represented the Caspian Higher School of Interpreting and Translation of Astrakhan State University, but also the International Federation of Translators (FIT) as a member of its Council. As a guest of honour, Prof. Egorova spoke at the forum opening session. She also made an expert presentation at the international expert discussion “Training for Future Demands” and shared her methodological recommendations and practical experience in preparing interpreters-to-be for real work. The School Director also participated in a session on Asian and rare languages and together with her colleagues discussed current needs for experts in Asian languages and cultures. This is particularly important considering the recently signed Convention on the Legal Status of the Caspian Sea as well as growing domestic and international demand for translators and interpreters working with the languages of the Caspian region.